For sale (or trade) is my Omega Seamaster 300 Big Triangle ref. 166.024. My Omega is all original from 1969. My Big Triangle has papers from the Air Force Exchange. It is powered by Omega cal. 565. The dial is in superb condition and the lume has aged to beautiful creamy color. The original hands match the color of the dial. 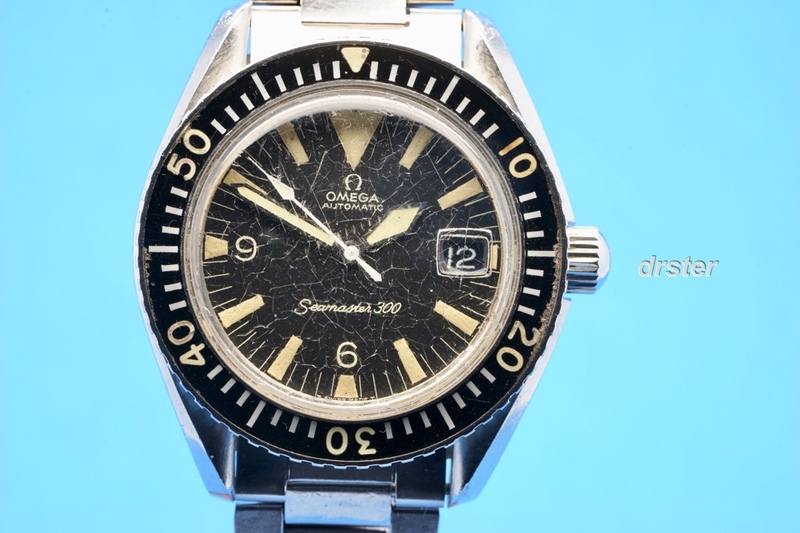 My Seamaster keeps good time and there are no issues. Here is a straight look at the dial. The crystal has many scratches. The dial is clean. An OEM Omega replacement crystal is included. Comes on the original Omega 1039 bracelet. Bracelet is dated 1969. Fit's up to 8". Inside caseback and movement seen here. The movement is in great condition. the Army/Air Force Exchange and replacement crystal. I have numerous references on TZ, Ebay. All as drster. Good guys on watchnet - Mark Tannenbaum. NEW REDUCED FURTHER PRICE: $8,250.00. Includes US shipping. Payment by wire, MO or cashiers check. Paypal + 3%.